The vines, as you can see, are full and lush. The vibrant green contrasts with the surrounding dry grass landscape. 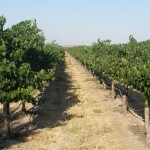 The abundant vine growth is, in viticulture slang, called “sprawl” meaning the vines “sprawl” to either side of the trellis, and, if the canes are of sufficient length, may even contact the ground, also known as the “vineyard floor”. 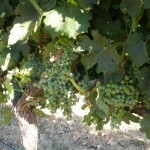 We employ the following practices to use “sprawl” to its maximum effectiveness in our vineyard. To provide for better fruit maturation, we “train” our vines using metal wires that run the length of the vine row, approximately one-quarter mile. Grooves on the metal vine posts allow the wires to be raised as the vine shoots grow. Raising the wires creates a more symmetrical look to the vine rows, but more importantly, allows us to tailor the amount of light and air that reaches the grape clusters. Photo orientation is looking directly east, the row on the left,which faces south, exhibits “sprawl’ and the row on the right, which is facing north, has been trained relatively upright. Since the vine rows here at ViñAlegre are planted in an east-west orientation, the hot summer sun tends to play longest on the south side of the vines. Earlier in the growing season, we have thinned the vine shoots to provide space for the remaining shoots to grow. Now we selectively remove leaves to provide additional light and air. This is a fine-tuning process that requires exceptional skill. Removing leaves demands instant judgment as to just the right ones to remove as well as the ability to do it quickly. Shoot thinning and leaf pulling for us must create a vine canopy with sufficient shade – moderate “sprawl” – on the south side of the vine rows and open enough on the north side to provide the appropriate amount of light and heat for optimum ripening. Achieving that delicate balance helps to ensure the grapes will be the best we can supply to the resulting wines.